This week's groceries were much larger than I expected. There were some amazing deals to be had. Tuesday I was at Albertsons since its so near my kiddos' therapy office. I found some chicken/tofu patties for $1.00 per box of 4. I bought 10 boxes since I'm looking for an alternative to the sausages in our packed lunches. There were also some Krave cereal snack packs on sale for $1.00 per box of 8. I went ahead and bought all 3 boxes that were on the clearance shelf. While I normally don't give my kids junky snacks like this, once in a while I have to grab something fast and I don't mind giving it to them very occasionally. I bought 2 packs of pudding for $1.00 each, a GF snack all the kids can have. Butter was $2.50/pound, limit 2. I bought rice cakes since they're detox friendly, some celery and bell pepper for the veggie tray I made for the Super Bowl party we are attending today. I spent $30.79. I went to QFC with 3 kids another night. I found big bags of chips for $0.89 each since they were labeled Fred Meyer instead of QFC. I also found some white corn/bean chips for $1.49 each. I thought I'd give them a try after the detox. I picked up a spiral-sliced ham for $1.49/lb, a bag of organic apples for $1.33/lb, a cold deli chicken on clearance for $3.99, some dented cans of soup for $0.59 each, and clearance fresh cheese tortellini for $1.99 each, Cucumbers and bell peppers were $0.59 each and one kiddo begged for vanilla yogurt so we got this big container of Tillamook. I spent $40.67. I went to two Albertsons to find these blue/green chips for the Super Bowl party and I'm so glad I went to the second one because I got a pile of meat for a steal. There are 5 packages of boneless pork and one package of bone-in pork, and one package of thin sliced beef. I paid just $12.92 for all that meat! I also got clearance yogurts for between $0.35 and $0.50/cup. The chips were B1G1 free at $2.99. 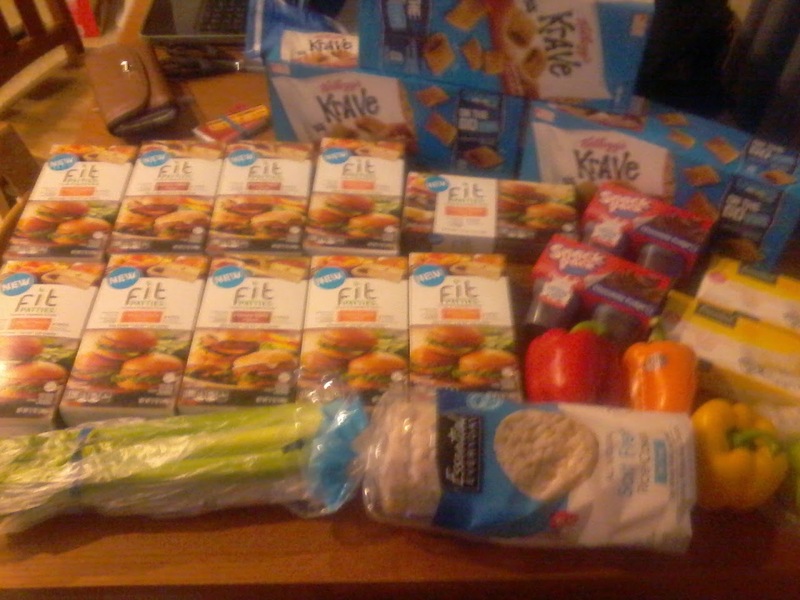 I spent $24.75 at the 2 Albertsons. I dropped into Haggen when I was in the area and picked up avocados for $0.77 each, and tomatoes for $0.89/lb. I also loooooove asparagus and got a bunch for $2.98/lb. I found spaghetti sauce on clearance for $0.50 and a box of fruit squeezies for $0.97. I also stocked up on candy for DH, for gifts, for party contributions, whatever. They were a $1.50/bag. I spent $16.70. No eggs this week and our milk delivery guy gave us milk free of charge! Yay!